Over the past year tens of thousands of workers in Ukraine have been involved in strikes and protest actions against deteriorating living and working conditions, unpaid wages, and harassment and firings of union activists. In February 2014 sustained popular mobilizations by workers and others, known as the Maidan, toppled the pro-Moscow regime in Ukraine. Since then working people have faced deepening attacks on living conditions and political rights by the bosses, the capitalist government in Kiev, and international “advisers” and lenders from Washington to the International Monetary Fund. The effects of the worldwide slowdown in production and trade have been exacerbated by a Russian-backed separatist war in Ukraine’s industrial southeast and by Moscow’s annexation of Crimea in March 2014. Three years into the war 10,000 people have died and almost 3 million have been displaced in Ukraine or have fled to Russia. Protests and underground sit-ins by thousands of iron ore miners in Kryvyi Rih earlier in May started at the Iron Ore Combine and included a tense standoff at Evraz Sukha Balka. Miners’ families and other workers assembled at the Evraz mine after management refused to let supplies through to 620 protesting miners nearly a mile underground. “The blockade was broken and the Evraz administration started negotiations,” Volynets said. An occupation at the ArcelorMittal mine administration building by more than 1,000 workers led to the opening of negotiations. Agreements were reached with all three companies for wage increases between 20 and 70 percent. The government of President Petro Poroshenko, who is worth over three-quarters of a billion dollars, is pursuing a series of anti-working-class measures, part of qualifying for loans of up to $17.5 billion from the IMF. These include the closure or privatization of state-owned industries, including two-thirds of state-owned mines; sale of publicly owned agricultural land; cuts in pensions; and a new anti-worker Labor Code. “The old, former state-run unions support the new Labor Code and the independent unions are excluded from the hearings on it,” said Volynets. Miners in the state sector have frequently barricaded roads and carried out other protests to get months of back wages. 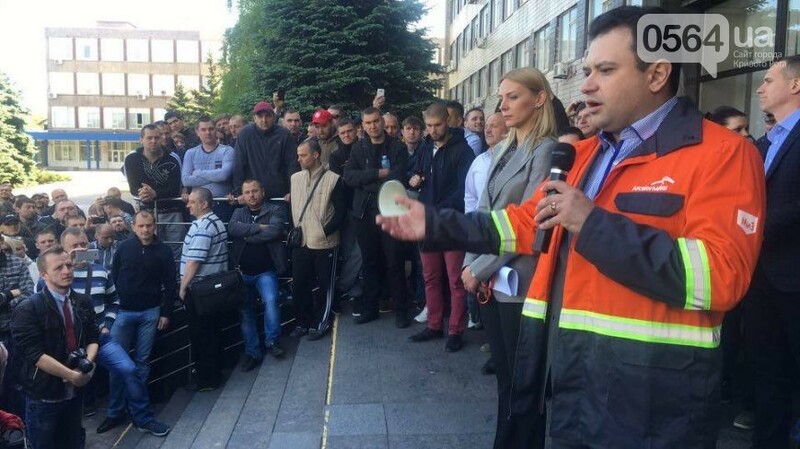 Miners from Novovolynsk in western Ukraine sent representatives to protest at the Ministry of Energy and Mines in Kiev May 16 over mounting unpaid wages. During March 35 people died in workplaces across Ukraine. From June 6 to 12, two miners were killed at separate mines, and four others were seriously injured in a methane gas explosion at another. “Workers are disappointed in the authorities and there’ll be more conflict,” Volynets said. Hundreds of rail workers protested outside the Ukrainian Railway headquarters in Kiev June 14. “We demand a wage increase of at least 100 percent,” said Vladimir Kozelskii, head of the Free Trade Union of Railway Workers of Ukraine. Their average monthly wage is 6,300 hryvnia ($240). The rail workers set up tents and continued protests over the next five days. On June 20 train drivers in Kremenchuk, in central Ukraine, started a work-to-rule protest backing the Kiev action. No trains left the depot. Republished from The Militant , (USA).